Eagles dominate Westmont to claim a convincing 7-2 victory. The Eagles traveled to Santa Barbara on Thursday to take on former Golden State Athletic Conference rival Westmont University. 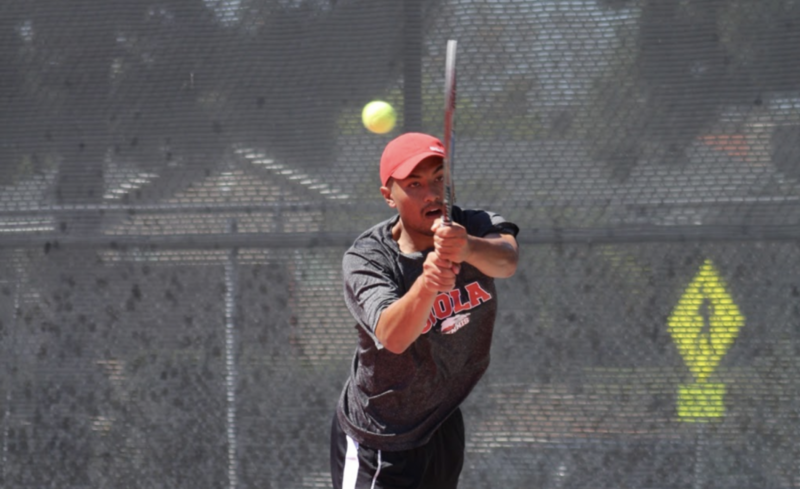 Biola played well in doubles and singles to pick up a 7-2 win over the Warriors. In doubles, the No. 2 duo of senior David Garcia and junior Derek James fell in a close match 8-5. The No. 1 squad of junior Erik Martinez and freshman Edwyn Ramos fell 8-6 to give the doubles point to Westmont, but the tandem of freshmen Andres Meneses and Ian Nieh picked up an 8-6 win, avoiding a sweep. Garcia claimed the first singles victory in the No. 6 spot, winning 6-3, 6-1. James followed that up with a convincing 6-0, 6-2 win. Meneses gained a victory after two sets as he lost the first one 7-5 and won the second 6-0 before his opponent retired. Sophomore Quentin Lau picked up a narrow victory on the No. 4 court 6-2, 7-6. Ramos won at No. 1 by a score of 7-6, 6-3. Sophomore Logan Blair claimed the final victory of the match for the Eagles, winning in three sets 6-3, 4-6, 6-0. Biola returns home on Saturday to take on Arizona Christian University at 1 p.m.